These lighthouse-inspired mills won’t signal sailors, but they can guide lively dinner conversation. Maine has more than 5,000 miles of coastline. Along those shores, 65 historic lighthouses stand as beacons of warmth and safety, protecting ships as they approach the coast. 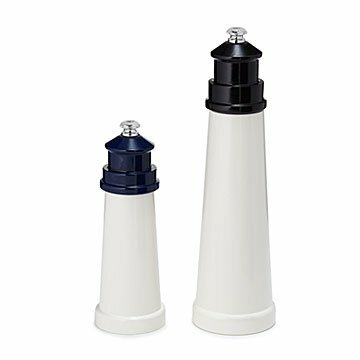 These stainless steel and maple salt and pepper mills are a bit too small to signal sailors, but they can guide lively conversation at your next family meal or gathering. Whether you're a Mainer yourself (fittingly, these mills are assembled there), a proud coaster, or a lover of all things nautical, this set will add a dash of charm to your table. Another bright idea? Give them to a friend who enjoys sailing or days at the beach, and watch them beam with joy. Made in Maine. This was bought for someone who has almost everything. She LOVED the salt and pepper mills because the are unusual. It was a perfect gift!